A LoRaWAN network is organized in a star-of-stars topology in which gateways relay messages between end devices and a central network server at the backend. The frequencies used by LoRaWAN depend on the geographic region and its radio spectrum regulations: 868 MHz (EU), 915 MHz (US) and 920 MHz (Asia). The end-device performs random frequency hopping and can use any of the possible data rates. The datarate of the connection can be changed by modifying the spreading factor in order to adapt to the range. The communication between the devices and the network is bi-directional, both uplink and downlink messages are possible. All communications are secured: the messages are encrypted using AES with a key length of 128 bits. Downlink frames can only be transmitted after an uplink transmission by the sensor. Once the sensor sends an uplink frame, the end-device will open two receiving windows: RX1 and RX2, the network can then send on one of these windows a frame that will be taken into account by the sensor. When a sleeping device is not transmitting a frame it goes into a sleep mode where it does not listen to the network. This mode permits to reduce a lot the consumption of the sensor. The network can send at any time a frame; it will be received by the sensor. The device open receive windows continuously. For over-the-air activation, end-devices must follow a join procedure before participating in data exchanges with the network server. Activation by personalization directly connects an end-device to a specific network. 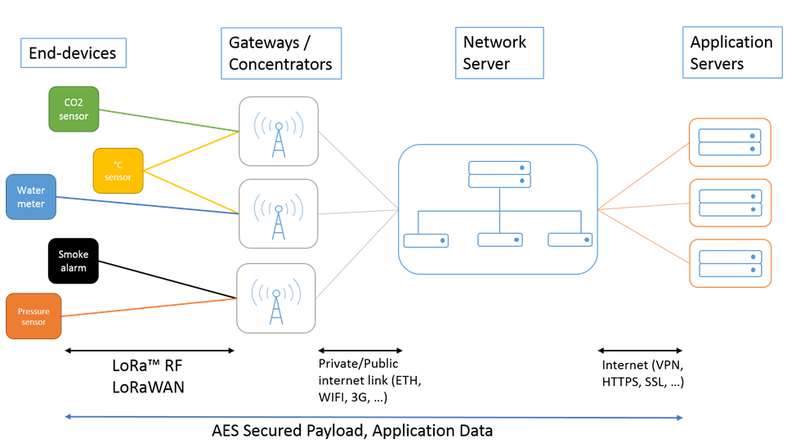 Activating an end-device by personalization means that the DevEUI, the DevAddr and the two session keys NwkSKey and AppSKey are directly stored into the end-device and shared with the LoRaWAN server. The network address of the sensor on the LoRaWAN network (DevAddr) consists of 32 bit, it identifies the end-device within the current network. The DevAddr is set on the 25 last bits of the DevEUI, and can be configured by a specific ZCL command. The nwkID is set to 0 by default. All the information above is provided at the delivery of the products. Nke Watteco devices work in both OTAA and ABP. When the device is switched on, its first attempt is to be connected in OTAA. If it fails, the device sends a frame with ABP configuration. This process of association is repeated while the device is trying to connect to the network by following a trickle timer which is multiplied by 2 after each try. A specific reassociation feature (Only available on « Confirmed » Uplink Mode) is implemented by default in Nke Watteco devices after each 4 days and after 100 frames if the sensor doesn’t communicate with the network. It can be configured by a specific ZCL command (LoRaWAN Cluster). Once the device is associated to the network, it preserves its applicative configuration and its mode of association even after a reboot. At the next reboot, the device works only in OTAA or ABP mode, dependly of the previous association. In ABP mode all network paramaters are preserved after rebooting. In OTAA mode, an association is done after each reboot. It is necessary to contact the operator to understand how to send downlink frames. The procedure can differ from an operator to another. The communication between the end-device and the network is done through Fport 125. Since April 2018, it is important to note that the sensor doesn’t ask for acknowledgement by default. It is in « Unconfirmed » mode. It is possible to change this behaviour by sending a specific ZCL command (LoRaWAN Cluster). It is possible to verify the default setting directly in the .txt file including keys. In order to give the possibility to the network to send data, the sleeping devices use a Trickle Timer system that permits to send regularly a Uplink frame to the network if no reports or batches have been configured. The Trickle Timer directly impacts the behavior of sleeping sensors. When a sleeping sensor is switched on, it sends almost immediately a void frame (a LoRaWAN frame without payload) to the network server. When the sensor is commissioned on the server, it answers the sensor and acknowledges the void frame of the sensor. At the beginning, the trickle timer is at 1 min. The trickle timer is multiplied by two after each sending until it reaches 24 hours. It is the maximum value of the trickle timer. When this limit it reached, a void frame will be sent every 24 hours. A void frame will be sent by the end-device following this pattern if there is no report configured. If reports are configured on the device, the void frames will be sent until the trickle timer becomes bigger than the maximum reporting interval. The application layer protocol implemented in nke Watteco’s sensors leverages on ZCL binary format. This combination of ZCL on top of a low power LoRa network should not be confused with “ZigBee®” technology, which uses its own network layer, not based on LoRa and operating at 2.4GHz. Nke Watteco sensors range can be up to 20 times the range of typical ZigBee® sensors. A cluster is a related collection of attributes and commands, which together define a communications interface towards the distant device. It is an application message, which may be a container for one or more attributes. Different clusters has been implemented in order to manage Nke Watteco sensors. This is a data entity which represents a physical quantity or state. This data is communicated using commands. In order to communicate with clusters and atttributes, it is possible to send generic commands. The application protocol implements the notion of “Endpoint number” to enable multiple instances of each cluster type on a given device. Different clusterIDs may share a common endpoint number but two instances of a given clusterID must have different endpoint numbers. The “Endpoint number” bits are distributed in the first byte of LoRaWAN payload as described below. Therefore an endpoint number can take 32 different values. It sends a report on a periodicity or on a variation of the measure. Minimum reporting interval: minimum elapsed time since last “sending”, to accept “sending” a new sample. Maximum reporting interval: maximum time without “sending” a new sample. When this time is elapsed, a new sample is automatically “sent”. Reportable change: minimum change on which a sample is sent. To disable the configuration of a device, change the value of the minimum and maximum sending interval and the delta to 0. A codec tool is available in python to decode the Standard report. It is used to concatenate, horodate and compress several samples of measure in the same reporting frame. • 0: Batch report frame. Field index: Each batch configuration is associated to a specific cluster/Endpoint/Attribut, however some clusters have multifield reportable attributes. The “Field index” parameter allows selecting the field to be reported in the attribute. Most of the time this 1 byte “field index” is 0, like in clusters Temperature, Humidity, Binary, … But sometime it is necessary to define the requested field inside the attribute like in clusters Configuration, Simple metering or TIC. Minimum recording interval: minimum elapsed time since last “recording”, to accept “recording” a new sample. Maximum recording interval: maximum time without “recording” a new sample. When this time is elapsed, a new sample is automatically “recorded”. The batch report is done on the minimum of the Maximum record interval of all batch’s configuration. If “Batch” is set on more than one Cluster/Attribute/Endpoint then the effective “Maximum reporting interval” of the batch is configured to the minimum of them. Recordable change: minimum change on which a dated sample is recorded. The Data type of this field is the same than the reportable value itself. Resolution: it has the same format of the Recordable change and specify the resolution of the returned measure. Tag value: it defines the “Label” representing the compressed measure in the “batch reporting” frame. This field is one byte decomposed in two fields: 0bxxxxxzzz: zzz are the number of bits used for the Label size. The Label itself is contained in xxxxx, it is defined by a specific Endpoint/Cluster/Attribute/Field. performances, current protocol, sampling parameter requirement and physical profile measurement. –All defined Labels have to be different than those that already exit. –To make a new configuration, it is necessary to use the same label of the specific measure. –It is important to dimension the size of the Tag related to the number of measures which will be batched. Longer the tag is, bigger the “batch reporting” will be. •Choose a resolution for each measure, the more it is small, the less measures will be compressed. In association with the sensors, nke Watteco provides a software tool useful to uncompress the batch report payloads send by the nke Watteco’s sensors. This software is provided as an executable and is called br_uncompress on a Linux OS or br_uncompress.exe on a Windows OS. -a: The utility br_uncompress is called with the option -a, it says to the program to consider the buffer as ASCII hex bytes. –The sample type of the attribute (it is specified in each cluster). The first value is the frame counter of the batch frame sent by the sensor, it allows to identify a frame. –The first column gives timestamps: the one in the first line corresponds to the sending time in seconds of the batch frame; after this one, all the others are the sampling time of the corresponding values. In order to know the absolute sampling time for all the attribute values it is recommended to use the timestamp of the frame sending as a reference.The time of reception is known by the client, therefore from these two data and by doing a difference with the timestamp of each sample it is possible to find out the absolute sampling time for each value. –The second column contains the label of each batch reported attribute. –The third column contains the values of the batch reported attribute.